Dr. Ahmed is fluent in English and Hindi. 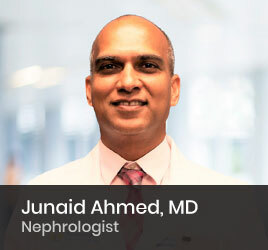 Dr. Ahmed has published articles in well-known medical journals including the American Journal of Transplantation, American Journal of Kidney Diseases, and Dialysis & Transplantation. Prior to joining Florida Kidney Physicians, he was part of Lifelink Healthcare Institute and Tampa General Medical Group. He continues to provide expert services to the Tampa General Hospital Kidney/Pancreas Transplant Program. He serves as Medical Director of the Living Donor Kidney Transplant Program at Tampa General Hospital as well as Medical Director of US Renal North Tampa Dialysis Center.